Would you like to be able to help out small business entrepreneurs remotely? How about being in a position to save their time, make their work more enjoyable, alleviate stress and help them take their businesses to the next level? Can you do this? Do you have administrative, social media or content creation skills? Or any other skills that would reduce the workload for someone else? 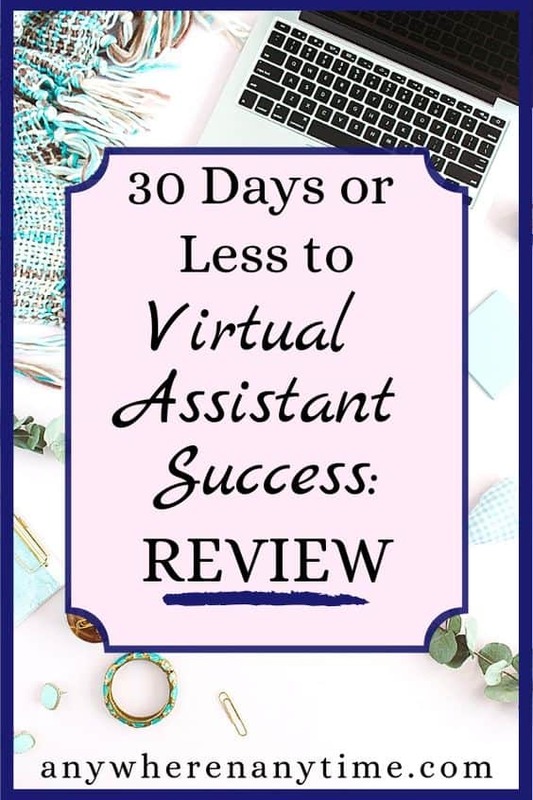 If so, you might be interested in this 30 Days or Less to Virtual Assistant Success review of Gina Horkey’s virtual assistant online course. 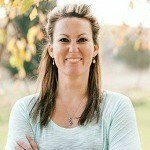 Though Gina Horkey had a steady job, she now works from home after building her own successful freelance writing and virtual assistant business from scratch (and in less than six months). She is all for sharing what she has learned along the way to make it easier for those who have similar dreams. Gina’s freelancing career started with writing. Virtual assistant work followed soon as it seemed to be a natural complement. 30 Days or Less to Virtual Assistant Success was the second course she created, which she launched in November 2015 via email. It was well received and so she transitioned version 2 of the VA course to a courseware. During that process, she completely rewrote it, doubling the content and adding video, quizzes and more based on what she learned from the first version. This resulted in the present online, self-paced, interactive VA course. Each year, they go through the entire course adding in new content and streamlining existing content to teach students exactly what they need to know to take action and succeed as quickly as possible. The course really emphasizes using Google tools, making it necessary for the few people who don’t really like working online with these particular tools, to find other options. 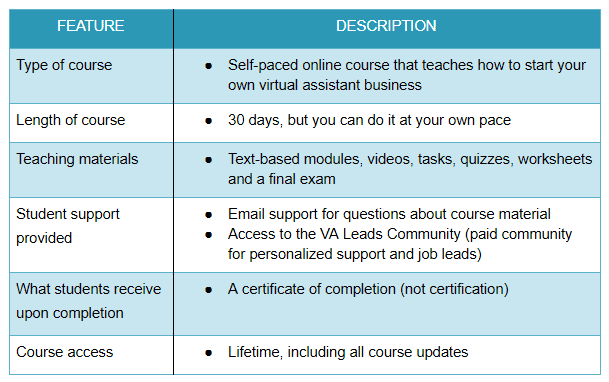 30 Days or Less to Virtual Assistant Success is an online, self-paced course that develops both the skills and the marketing techniques needed to succeed as a virtual assistant. The goal of the course is to help students start a new VA biz from scratch using skills they already have or by learning new ones. The core material is presented through clearly written text organized into 10+ modules. There are also videos to supplement some of the concepts or take the conversation a bit deeper. Gina provides checklists and quizzes for each module, as well as a final exam, to help you monitor your progress and there are additional tutorials, templates. Who is 30 Days or Less to Virtual Assistant Success For? This course is ideal for brand new VAs, be they stay-at-home moms or dads, retired people, travelers, physically challenged people, individuals ready for a career change, or anyone who wants to work from anywhere and be in charge of their own schedule. It is also helpful for VAs who aren’t achieving the results they want. It is for people who want a career helping small business owners virtually and are ready to work hard to get a new web-based virtual assistant business rolling within a month or two. Attention moms and dads: This is a flexible career choice for moms and dads who want to work from home because VA work is typically done on your own schedule. You decide how many hours you are able to work, what type of work you are interested in, and whether or not you can meet the needs of a particular client. If a client needs a quick turnaround time or frequent phone calls, they may not be a good fit for you, but that’s the great thing about running your own business: you get to decide who to work with. As mentioned before the core of the course is divided into 10+ modules. Incorporated into the text modules are also short videos, podcasts, and links to additional articles and tutorials. Gina uses downloadable checklists and quizzes to help you gauge how much you are absorbing. The checklists are generally actionable items which lay the foundation for launching your VA business. The course is focused on helping someone to start a VA biz from scratch, including selecting services to offer, finding/landing clients, and working effectively with them. It also covers things like invoicing, contracts, and business entities. There is an entire module that houses Q&A interviews with various industry experts to showcase the need for VAs and what the service offerings look like. Gina also shows how to make the best use of many free resources and puts a lot of emphasis on the basics of Google tools as they are free and easy to use. Email support is available for students who have questions about the course material. If a student is wanting more personalized support, the VA Leads Community is a private Facebook group that course members and graduates have access to join for an additional fee. Group members get access to client leads, biweekly office hours, monthly expert Q & A’s, dedicated tech support, and like-minded peers. Not only do they teach you how to start a VA business from scratch, but they also help you to get hired through the unique, high-quality client leads that are shared with community members. The first 90 days are complementary, then there is the fee after that. Obviously, you need to know how to use the internet. Current members get access to all updates of the course material, so if this is something you know you want to do, it’s a good idea to buy sooner than later. I found the material to be well organized and clearly presented. Gina uses her own experiences to show what to do and what not to do, and she makes the material relatable, so you feel like you’re learning from a friend, not just taking a boring class. It’s important to remember that no single course can teach you everything. Each client will use different software for instance, so there’ll always be some learning on the job. 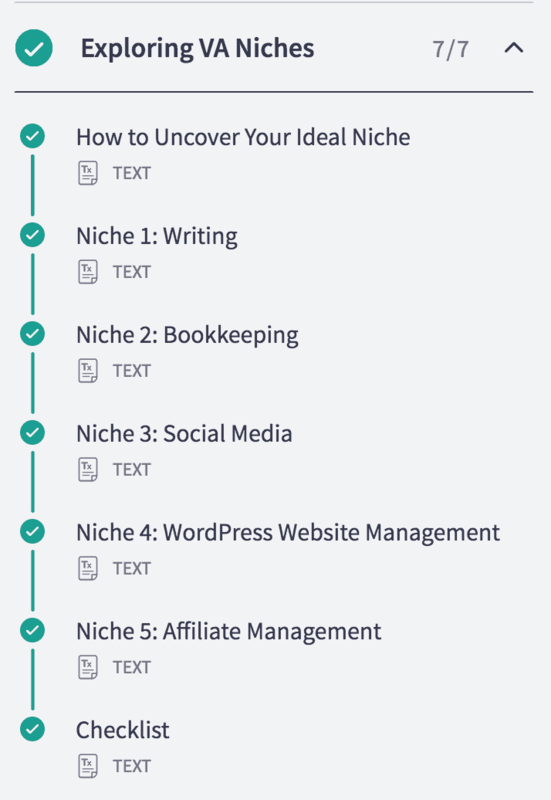 The course does a great job with providing basics and pointing to different reputable resources to dive into areas in more detail. If you would like some more details about how this career opportunity can work for stay-at-home moms, read Gina’s interview about being a VA. Or if you want a better idea of what VAs do you can check out Gina’s list of 150 services you can offer as a virtual assistant. Verdict: It is a legitimate anywhere anytime career option. Do you have skills that could help free up someone else’s time? Have you ever done small services for someone remotely? Let’s hear about them. Or do you have any questions? Let’s hear those too! Do you know if the course is still available? Is this where you take the course? I’m really sorry about that. The offers and links were recently changed and I hadn’t updated this post yet. Gina now offers a free list of 150 different VA services to give an idea of the scope and possibilities of this career. The previous free email course has been enhanced and reformatted into a workbook which you will get more details about when you receive the free list of VA services. Yes, Nate, you can make a part-time (or full-time if you want) income as a VA. It all depends on how much time you spend doing it, how many clients you take on and so on. Gina teaches the ins and outs of all this in the course. If you haven’t already, I would suggest you take Gina’s free Jumpstart course to get an idea if being a VA is right for you. Thank you very much Robin. I am definitely interested in doing this. I really enjoyed reading your post on what sounds like a great work-from-home opportunity. I really like that you included a free training program, then gave the pro’s and con’s of that program. You also did a great job of breaking down and reviewing the paid training option. It is great to have a personal review. I was wondering though – do you know anyone who has actually done it and is making a career out of it? Glad you liked it, Rachael. I think the pros and cons really give a picture of what you can expect to get out of it – I’m always particular to have them in my reviews. Actually I know a couple of people who have taken the course – both stay-at-home moms. So it isn’t full time work for them, but it is a real career that adds a steady amount to their monthly income.